Just Sold! After a peaceful day in the countryside, we headed to the Luberon hill towns today. 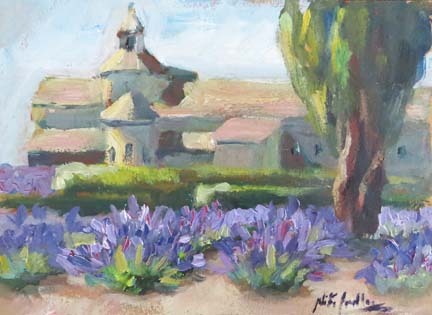 Starting our journey at the Abbey de Senanque, some of our group toured the twelfth century sanctuary's interior, while others painted and photographed the lavender fields and grounds surrounding the abbey. Next we traveled to the red and gold colored town of Roussillon, known for its ochre cliffs. Filled with picturesque views, art galleries, restaurants and interesting shops, everyone enjoyed having some free time to wander before we took off for the Pont Julien bridge. 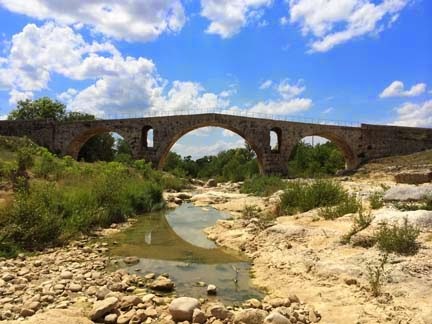 The Roman bridge, dating from 3 BC and constructed without mortar, is an architectural marvel that was still driven on until 2005! After surveying the bridge, we headed back to our b and b. 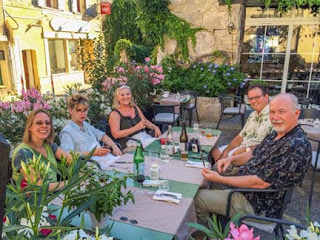 Dinner that night was traditional Provencal fare, including fresh vegetables, fish, meats, and goat cheeses loaded with delicious sauces, garlic and butter. Yum! Next summer we will be leading an Art Trek to Spain and the following year we will be headed to Tuscany, Scotland and Ireland, so if you've always dreamed of painting, photographing and sightseeing in Europe, please join us for one of these amazing trip! See details at ArtTreks.org. Please check out my website at NikiGulley.com, NikiGulley.com to see more of my contemporary impressionist oil paintings.